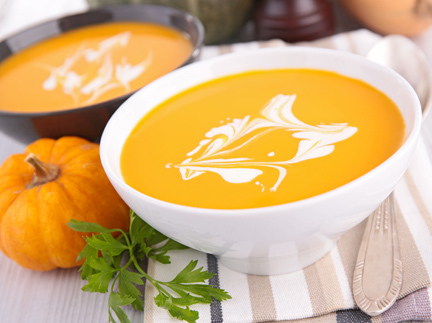 Zingy and sweet, our Ginger Pumpkin Soup has all the spiciness of fall. Loaded with layers of flavor, our recipe could be served for a special event or a simple weeknight dinner. Sugar Pie Pumpkins are the best choice for this recipe. You can finish the soup with either coconut milk or cream. However, we must say, the coconut milk makes this soup exceptional. Preheat the oven to 375 degrees. Cut the pumpkin(s) in half; scoop out the seeds and stringy parts. Lightly salt and pepper the flesh. Place the pumpkin(s), cut side down in a large baking pan. Fill with ½ inch of water, cover with foil and bake for 1 hour or until the flesh is easily pierced with a small paring knife. Remove from the pan and set aside to cool. When cool enough to handle, scoop the flesh from the outside skins; discard skins. Melt 2 tablespoons of butter in a large 12″ sauté pan over medium heat. Add the onions and apples. Lightly salt then sauté until the onions are sweet and browned and the apple are soft and browned – about 20 minutes. Add 1/2 cup of brandy and cook until the brandy is completely absorbed. Heat a large stock pot over medium heat. Melt 2 tablespoons of butter and add the ginger and garlic. Sauté for 3-4 minutes, until softened. Add to the stockpot the pumpkin and the onion and apple mixture. Pour the chicken stock over the vegetables and add cloves, nutmeg, cayenne pepper, and cinnamon. Stir to combine well. Bring the soup to a low boil, then lower the heat to medium and let it simmer 60 minutes. Using a food processor or blender, process in batches to the consistency of a purée. Or use an immersion blender in the stock pot to blend the soup to the consistency of a purée. Add the coconut milk or cream and season with salt and pepper to taste. If the soup is cool, reheat to warm. Serve in bowls and swirl in a tablespoon of Crème Fraiche or sour cream before serving.